Rooms from 20 to 160 people are available for editing, banquets, lunches and dinners for groups and conferences. The Park Restaurant Le Calandrine is a reference for anyone seeking gastronomic and convivial emotions. A rich calendar of events is scheduled, including the Spring Festival, part of the gastronomic festival "Le Superbe", which devotes its appointments to the white asparagus of Cimadolmo. Each event is run to satisfy customers and is a feast for the mouth. 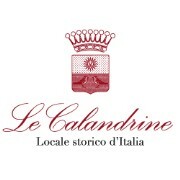 Thanks to the winery Le Calandrine offers an spot to taste wines at every opportunity. From Treviso (km. 15) direction Maserada - Cimadolmo. From the Highway: exit Treviso North and continue for Cimadolmo. From Conegliano (km. 15) follow to S. Polo di Piave - Cimadolmo. From Oderzo (km. 13) keep the direction to Ormelle - S. Polo di Piave - Cimadolmo.